Throughout the month of July we continued to work tirelessly on your behalf to change Maryland for the better. We furthered our commitment to fixing Maryland’s roads and bridges with the official start of the Watkins Mill/I-270 Interchange Project. This major congestion relief project will improve one of Maryland’s most heavily traveled roadways in Montgomery County, benefiting tens of thousands of Marylanders who drive the I-270 corridor. Read more about the project below. In this month’s Commerce Corner, Harford County celebrates the opening of United Foods International’s first East Coast location, bringing 125 new jobs to the Belcamp area. Maryland is Open for Business! In Howard County, we were excited to announce that ELTA North America will be opening a state-of-the-art Cyber Center in Annapolis Junction. ELTA is a world-class defense company and we are proud that they have chosen to expand their operations here in Maryland as a result of our trade mission to Israel last year. And on the Eastern Shore, I had the chance to meet with thousands of Marylanders from around the state at the annual Tawes Crab & Clam Bake, one of my favorite summer traditions. 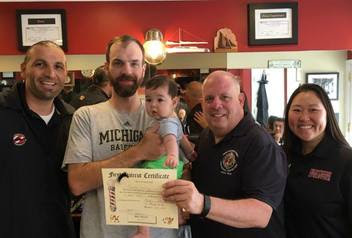 I’m thankful that I was also able to enjoy some family time, especially taking my grandson, Cam, for his first haircut at Capistrano Barbershop in Annapolis! See more adorable photos here. 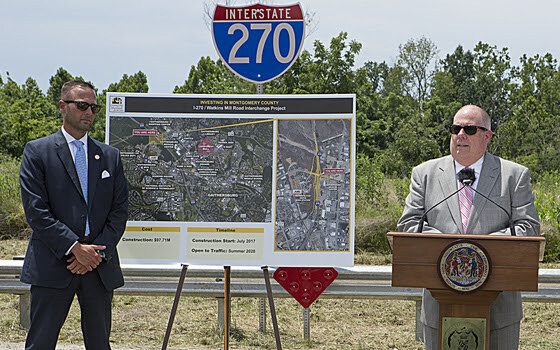 Governor Hogan announces the official start of the Watkins Mill/I-270 Interchange Project in Montgomery County. On July 11, Governor Hogan announced the start of construction of the $97.71 million I-270 interchange project at Watkins Mill Road. This major congestion relief project will improve one of Maryland’s most heavily traveled roadways in Montgomery County, benefiting tens of thousands of travelers who drive the I-270 corridor. This month Governor Hogan celebrated two major economic development achievements: ELTA North America selected Maryland for its new Cyber Innovation Center; and the grand opening of the Baltimore Cyber Range, a collaboration between Baltimore-based Electronic Technology Associates (ETA) and Cyberbit North America. The successes follow the governor’s economic development and trade mission to Israel in September 2016. ELTA recently opened their new headquarters in Annapolis Junction, upgrading from a 7,500-square-foot facility to a 21,500-square-foot-facility and announcing plans to add as many as 50 new jobs. ELTA North America’s decision to locate the Cyber Innovation Center in Maryland is the direct result of negotiations between Governor Hogan and company leadership, including a site visit to ELTA’s Israeli headquarters. 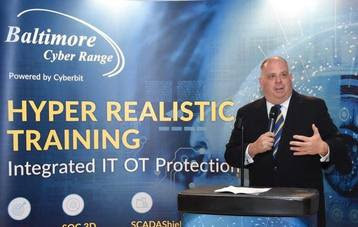 Governor Hogan also celebrated the grand opening of the Baltimore Cyber Range, which will provide cybersecurity professionals with the most advanced cyber warfare strategies in an environment that simulates real threats. Learn more about the chefs and products featured and see photos from the event here. 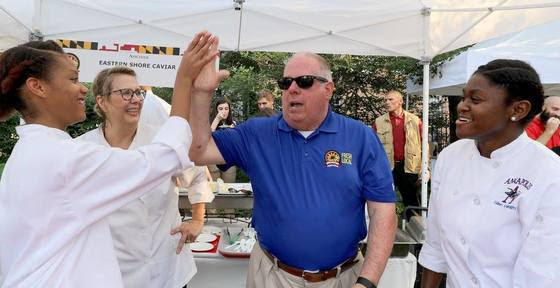 Governor Hogan made the trip down to Crisfield on the Eastern Shore on July 19 for the 41st Annual J. Millard Tawes Crab & Clam Bake. 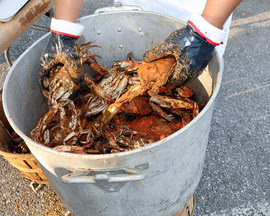 The event, known to regulars simply as “Tawes,” is one of the most anticipated traditions of the summer, attracting elected officials and Marylanders from every corner of the state. While there, Governor Hogan met thousands of Marylanders, discussing with them a wide range of issues from job creation to protecting the Chesapeake Bay. At the end of the day, he had just enough time to crack open a couple of jimmies for himself! United Foods International Co. (UFI), a Japanese private label food manufacturer, celebrated the grand opening of its first East Coast location in Belcamp in Harford County. The company, which is ramping up production and plans to create up to 125 new jobs, has been in a test production phase for the past year and currently has approximately 25 employees. UFI, whose private label products include a variety of custom Asian sauces, soups, condiments, and dry blends, first opened a U.S. office in California in 1988. The company’s significant growth plans follow a Memorandum of Cooperation signed by Governor Larry Hogan and the Embassy of Japan in August 2016 to foster trade, investment, and other forms of collaboration between Maryland and Japan. Governor Hogan this month announced regulatory reforms that will save Maryland taxpayers time and money, as well as protect the health of our environment, through common sense changes to the Motor Vehicle Administration’s (MVA) Vehicle Emissions Inspection Program (VEIP). The changes include extending initial VEIP inspections for new vehicles by one year. This announcement implements a recommendation from the governor’s Regulatory Reform Commission’s 2016 report, released in December. It was under the Liberty Trees in the 13 original colonies that the Sons of Liberty planned their protests of the Stamp Act and plotted their rebellion against the British. Back in 1999, Annapolis lost the original Liberty Tree – the last surviving from the original 13 colonies – after the devastation of Hurricane Floyd. Fortunately some seeds from that tree were preserved, and new saplings were born. 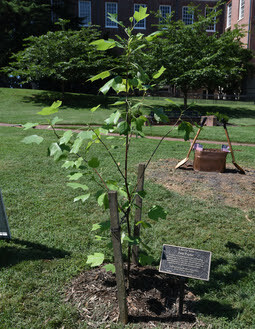 The new Liberty Tree, pictured above, was recently planted on the State House grounds.